Dust, Sweep, Clean, & Mop. A Flexible All Purpose Cleaning Tool. Not quite a mop and not quite a broom. The Swooz is an incredibly versatile cleaning tool that can be used to sweep, dust, mop, clean windows and walls, wash your car and more. It can be used wet or dry to accomplish any number of cleaning tasks. The incredibly flexible, all rubber head is able to bend and flex to conform to virtually any surface, or to reach almost any where. It is also features a convenient shape and size that allows it to get into corners, under furniture and conform to odd angles. The swooz makes hard jobs easy thanks to it's great design. The commercial grade, telescoping handle can be adjusted to the perfect length for any job. It can go from " to a full " in just seconds. The fun looking, chenille pads are totally reusable and can be used wet or dry depending upon the job you are doing. Thanks to the high quality microfiber cleaning pad, the Swooz is able to deep clean surfaces without the use of chemicals too! Use it dry or use just water as a detergent for those tougher cleaning jobs. With only water and your Swooz, you will be able to clean 99% of all dirt, dust and germs from virtually any surface. It is also quite gentle as it deep cleans. You never have to worry about scratching or otherwise harming any surface when you clean with the Swooz. This great eco-friendly cleaning tool has so many uses that it is well worth the surprisingly affordable price tag. Use it to clean crown molding, dust baseboards, clear cobwebs in hard-to-reach places, wash the top of a van or truck, clean your floors, wash walls, clean under the bed and so much more. You will find use after use for this versatile cleaning tool. When used dry it is great for dusting, sweeping and polishing. It is also highly absorbent when dry, so it can be used to clean spills quickly too. Get the Swooz wet and it can be used to clean floors, wash vehicles, wipe exterior windows, clean walls and ceiling fans, the list goes on and on. 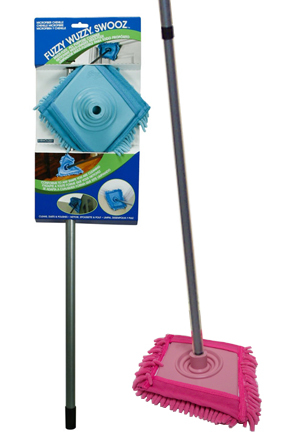 The advanced microfiber head creates more surface area as individual fibers skim the surface to lift up and lock in dirt. The Swooz's unique rubber gasket design conveniently conforms to virtually any shape giving you just the right balance of flexibility, leverage and stiffness. The head is a thick, one-piece solid rubber diamond that has a reusable chenille pad attached to it. The rubber portion is virtually indestructible, and the pad can be machine washed and reused hundreds of times. Each Swooz also comes complete with a commercial grade, steel telescoping handle. Get a Swooz today to start discovering all the things that can be cleaned with it. Don't just clean it, Swooz it! The fast, easy and safe way to clean all over. Order Yours Today! Head Size 12" x 10"
Fuzzy Wuzzy Swooz - Discover a different way to clean. This unique cleaning tool makes some of the hardest jobs easy thanks to the clever design. Sweep, dust, mop and clean with the same device. Wet or dry, the Swooz is an incredible way to clean. It makes a great cleaning tool. Wish there was a wringer for the Swooz! great dust mop, great wet mop too. I use it to follow up when I steam the floor. Love this mop. I take the mop head off and wet and wring it out and use it to mop all my hardwood. No soap need. pop the mop head in the washer machine and dryer and your good to go for next cleaning. I have three dogs and I can't do with out this mop. I wore out mine and searched until I found them. Would really recommend this product. This Fuzzy Wuzzy Swooz is exactly what I have been looking to clean my tub and shower. I don't have to get on my hands and knees or step into the tub to clean now. With the extension handle I am safely on the floor to reach anywhere I need to when cleaning. I love my fuzzy wuzzy swooz - it makes cleaning so much easier and is easy to wash. I like being able to go after spider webs from a distance and it is the best thing for behind furniture I do not feel like (or cannot) move. I'm not able to get the handle to extend. I loosened the connection, but the handle won't extend. I have similar dusters, so I am familiar with how the telescoping handles work. This came with no instructions at all, so I'm stumped. What's the secret? Despite what it may look like, you do not turn any of the plastic parts or connections to operate the telescoping pole. Instead, take one portion of the actual pole in one hand, and the other part in the other hand. Twisting to the left should cause it to become loose, and twisting the other way should cause it to tighten and stay in place. If you think you have a defective handle, please give us a call. 1)Has this company come out with replacements dust or mop heads for the Fuzzy Wuzzy Swooz? 2)When using with water how would you ring out the extra water? We do not have replacement pads for this at this time. The rubber head is very flexible, so a mop wringer would probably work, otherwise, taking it off would be the most efficient way to eliminate moisture. There is only a single color available at this time. When more than one color is in stock, we allow customer to choose the one they prefer. Sorry for any inconvenience. What is the length of the telescopic handle? The pole measures anywhere from 34" to 60". It would be difficult or impossible to find this product in a store local to you. That is the case with most of the stuff we sell. If you order from us, we'll have it to you within a few days.